Although I am a nonfiction publisher at the moment, I still love to read fiction in a variety of genres, from literary novels to thrillers. And I think for most editors it’s impossible to read a book without your editorial reflex twitching from time to time, especially when you see the author make a misstep. This week I have been reading an adventure novel that made me think yet again about the distinction between surprise and suspense--and in a broader way, what draws readers into a narrative. Filmmakers learn to boil a story down to its essence, and to find the most dramatic way to organize the elements of a narrative. They think about this stuff all the time. And it was Alfred Hitchcock who gave one of the most famous explanations of how suspense and surprise differ. In the first case we have given the public fifteen seconds of surprise at the moment of the explosion. In the second we have provided them with fifteen minutes of suspense. The conclusion is that whenever possible the public must be informed. Except when the surprise is a twist, that is, when the unexpected ending is, in itself, the highlight of the story. Once again, imagine a restaurant where there’s is a ticking bomb under the table, and we in the audience know it’s going to go off in fifteen minutes. Now imagine one of the characters knows it as well, but can’t reveal it. With this, the suspense ratchets to another level. Not only are we aware of the impending explosion, we share in the character’s anxiety to get away and the excruciating effort of acting totally unconcerned even as the bomb ticks down. The emotional connection we have to a character for whom this situation is a matter of life or death makes the suspense we feel that much greater. Hitchcock’s bomb is simply an extreme way of focusing attention on the most essential question the author of any narrative, fiction or nonfiction, needs to ask—and answer—about a given storyline: Why should we care? The more emotionally invested readers are in what happens to those in the story, the more compelling it will be. And our emotional investment comes from understanding what the stakes are for those characters. *I am sure Tom credited Hitchcock for the insight, but I have not been able to find an original Hitchcock reference. Sources welcomed. Guy LeCharles Gonzalez's Tumblr tipped me off to a neat post by James Bridle at BookTwo.org. 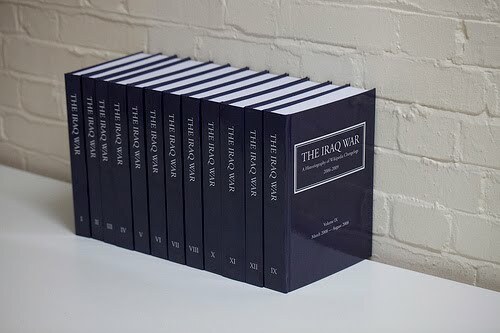 More accurately, to a post about a neat project that Bridle has undertaken: he has created a multivolume printed set that records the editing history, from 2004 to 2009, of the Wikipedia entry for the Iraq War. If you land on this Wikipedia page at the wrong time, you might find unhelpful "information" like that. But most of the time you'd get a lot of useful facts, 95 percent of them or better probably accurate. And as James Bridle points out regarding the Iraq War, the constant changing of the article is itself a valuable fact--a record of our historical knowledge as it lurches forward--or sometimes back. This is what culture actually looks like: a process of argument, of dissenting and accreting opinion, of gradual and not always correct codification. For anyone pondering the value of Wikipedia compared to "traditional" reference sources, an absolute must-read is an essay, now several years old, by the late Roy Rosenzweig, one of the pioneers of digital history, titled "Can History Be Open Source?" It's quite long and addressed principally to his fellow historians, but deeply thoughtful and open-minded. His overall assessment of Wikipedia is quite positive. He too compared Wikipedia to more established sources (Microsoft's Encarta and the American National Biography), using biographies as his sample, and concluded, 'Wikipedia is surprisingly accurate in reporting names, dates, and events in U.S. history." the difference lies in McPherson's richer contextualization [and] even more by his artful use of quotations to capture Lincoln's voice, by his evocative word portraits....and by his ability to convey a profound message in a handful of words. Admittedly, putting Wikipedians up against James McPherson on Lincoln is sort of like sending the people sitting in the bleachers up to bat against C.C. Sabathia. This is only to say that encyclopedia entries, like any other kind of writing, are better done by a single talented person than by a committee, but it doesn't mean the committee version doesn't have value. There is much more to Rosenzweig's article than this, and for anyone who's thinking about plunging into the nine volumes of The Iraq War, it would be a good place to start. I have posted a link to this clip elsewhere but it's so funny (and relevant) I had to do it again here. Yes, it's awful when you have to get used to some newfangled technology for reading. Imagine what it was like when you grew up with scrolls. The literary agent Nathan Bransford, who writes one of the shrewdest and most entertaining blogs about publishing, recently had an excellent post on a much misunderstood topic: just what publishers actually do for authors. (In brief: a lot.) With the increasing ease of self-publishing in an e-book marketplace; prominent authors dropping their publishers to sell their work themselves, the question of whether and how publishers "add value" to an author's work certainly calls for discussion. Self-publishing is a difficult road to take. As an experiment, I uploaded two short works to Amazon and made them available in the Kindle store. I designed the covers, did the editing, and the layout design and html code juggling that needed to be done in order to get them looking right. And let me tell you, after all of that, the time you have to put in to promote your work is exhausting. And there aren't many ways to do it successfully. The grand total of copies sold thus far (after several months)? Somewhere around 14. Four of which were to relatives. I was very fortunate. After being rejected (but almost making it!) by traditional publishing I let my book set on the hard drive a couple years. Then Kindle store came along and Bezos offered to e-publish my book for free. With nothing to lose I used the digital text platform interface (very easy) to upload my book. I created a cover from a beautiful photo taken by a friend. My book has sold over 5,000 copies, and continues to sell at a brisk pace. I've added more books, and I have a nice monthly income. I don't have a blog, don't use Facebook, have never twittered. I don't even use my name on blogs (like this one). My books sell very well and I'm making more money than I ever imagined, thanks to 70% royalty on Amazon. Marketing is not necessary. Even though they report completely opposite results, both of these stories illustrate the same fact about self-publishing: as I have said elsewhere, the skills involved in writing a book are utterly different from the ones necessary to flog it to the buying public. A writer capable of creating a wonderful book may have no aptitude--or as author B's comment suggests, no interest--in networking with readers, flacking her product, etc. That's where publishers come in. None of this is to say that self-publishing may not be viable and even preferable, for some authors, to the old-school method. But when it comes to reaching the largest possible audience, a HarperCollins or Random House, with its marketing expertise and massive distribution apparatus, still offers something pretty powerful.